Posted 2:19 am by muni & filed under Ajax, HTML5, JQUERY, MYSQL, PHP. 1. This Quiz application is responsive one, it will automatically render in desktop, mobile and tablet based on screen size and resolution. 2. This application has both previous and next button functionality. 3. For demo purpose I added user simple user registration. 4. User can choose category when they going to start an Quiz application. 5. Finally user score will be saved in database. This is very simple application, please follow the this tutorial at the end you can make it yourself. Now add the following sample data’s in it. 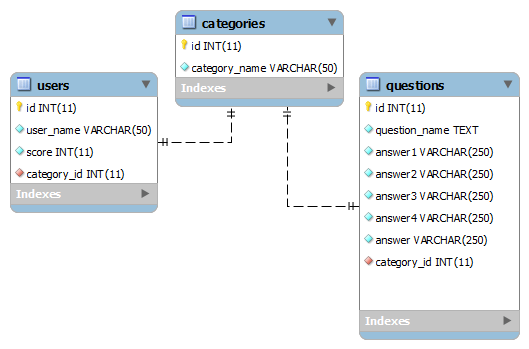 Here is the sample database relational daigram of above three tables. Create config.php file to keep database connection in a separte file. Create index.php file and the following scripts in it, which take care user registration process. remote : "Name is already taken, Please choose some other name"
required : "Please choose your category to start Quiz"
Now create check_name.php file which take care unique name check in the database while user registring. Now create question.php and add following scripts. This is main file of this quiz application which gets questions randomily from database for each the user. As well it take care previous and next button functionality using jQuery. Finally create result.php file and add the following lines of script in it. Finally create logout.php file which take care user logout process as well it redirects the user to index page.